Bitcoin price has climbed over $7,000 while its hash rate also spikes over 50% this month and about 30% in just two days. This has the experts reiterating their bitcoin price predictions stating a new Bitcoin high is coming and long-term interest of investors in leading crypto. 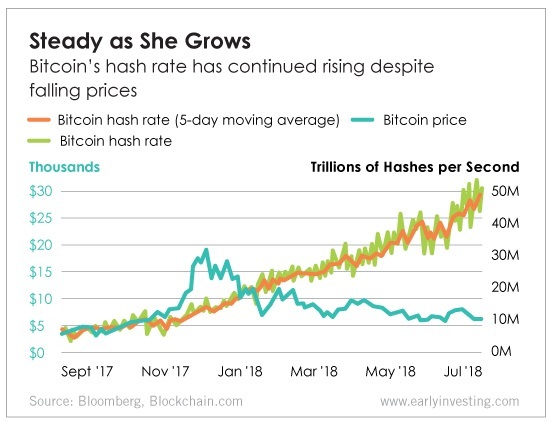 Bitcoin’s hash rate has spiked to a record high of 62 Exahash/s as of 26 August 2018, where an Exahash is equivalent to 1,000 Petahash, and a Petahash equals 1,000 Terahash. The previous record high was 54 Exahash/s on 10 August. This continues the long-term trend of Bitcoin’s hash rate exponentially increasing. To put this in perspective, up until the second half of 2013, hash rate was less than 100 Terahash/s. It may seem somewhat surprising that Bitcoin’s hash rate is hitting record highs even though the price is near a low for 2018. In the middle of August, this was as low as $5,800, after hitting $20,000 in December 2017. Bitcoin has rallied and is sitting at $7,100 as of this writing. Perhaps this price increase, combined with expectations that price will increase even more, has allowed miners to switch on rigs that had become unprofitable. Additionally, with an increasing price, miners have more motivation to purchase and install more rigs. The spike in hash rate this past week has been rapid, from 45 Exahash/s to 62 Exahash/s. This is perhaps indicative of a mining supersite being switched on. 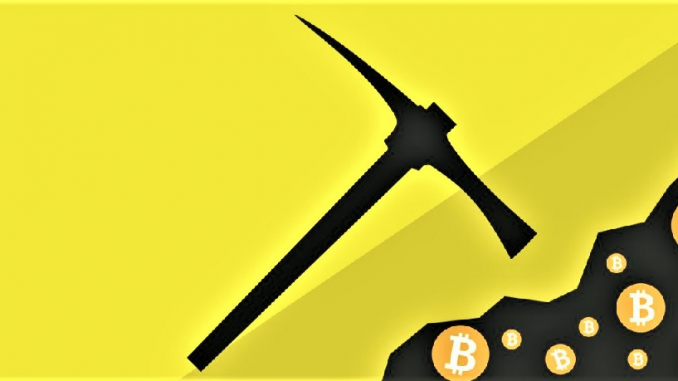 A past article on Bitcoin News discussed how mining supersites were being developed for USD 0.5-1 billion by big mining companies like Bitmain, and these supersites would cause an extreme spike in mining hash rate and difficulty that could make small mining operations unprofitable and obsolete. Indeed, mining difficulty is higher than ever at 6.7 trillion, and next time it updates it should be well above 7 trillion. The era of personal Bitcoin mining could be coming to an end quite soon. Bitcoin’s mining hash rate is one of the best measures of the network effect, where more hash rate means more investment into Bitcoin’s infrastructure in expectation of future price increases. The spike in hash rate is enough to cause speculation and an increase in Bitcoin’s price, like the market has seen this past week. It’s somewhat of a feedback loop, higher hash rate means a higher network effect, which makes investors buy more Bitcoin, and that leads to more profitable mining conditions and therefore an even higher hash rate. Bitcoin hash rate has constantly been on a rise but this time it has hit another level as the hash rate sees a huge spike. The computing power of the Bitcoin network has broken over sixty quintillion hashes per second, reaching a new high. If we take a look at the previous months, in June, this rate has been around 43 quintillion level. In July, the fifty quintillion mark has been broken and now in August month alone, a rise of fifty percent can be seen. Since last year in December, when the bitcoin price hit its peak, the hash rate also took on an ascending curve. However, despite the market wide-correction where Bitcoin lost more than 60% of its value while altcoins decline more than 90%, the hash rate is only increasing. Actually, the network hash rate has spiked over 150% over the last six months. Moreover, in the last two days, the spike in hash rate has been even more astounding i.e. of 35%. If we take a look at the BTC price chart below, Bitcoin has also risen. Yesterday, it even broke the $7,000 level. At the time of writing, the world’s leading cryptocurrency has been sitting at $7,084 with a 24-hours trading volume of $4.87 billion. This increase in hash rate can be attributed to the entry of new miners into the market who are unperturbed of the staggering prices. Though over the time the connection of hash rate and bitcoin price has been severed unlike when bitcoin first came into the market, experts do find a connection. According to Max Keiser, the financial analyst, former wall street trader, and cryptocurrency expert, price follows hash rate and he firmly believes a new all-time high (ATH) is coming. Previous Post: Will Ethereum Classic (ETC) Dominate IoT ?